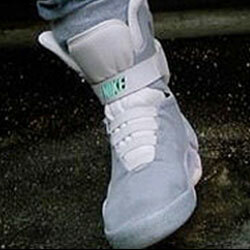 ME WANT: Nike Air Mags to be announced today? There’s a big event taking place at the Nike this morning, that might just “change the course of time.” The invite sent to select people (not us of course, because everyone knows how much love we have for the Back to the Future franchise), that featured Doc Browns glasses from the future, and an audio message that hinted some serious S**T was about to happen. Then of course there is this teaser trailer that suddenly appeared online yesterday. Now we do know that Nike did submit a patent for the Nike self-lacing Air Mag shoes a year or so ago, and from the video above, it looks like the fantasy footwear is about to become a reality. We’ll update this post as soon as we have more news, but for now, there are two questions you should be asking yourself – 1) How many shoes are going to be produced, and 2) how much are they going to cost? I understand there may be a few shoes on sale today to benefit Michael J. Fox’s charity, but I doubt the common man will be able to pick up those shoes. What I am hoping is these shoes will sell for less than $125 a pair, ’cause, I’m going to need at least three pair. Previous ArticleTELEVISION: Locke & Key heading to MTV? Knee-Kay? What’s that some kind of injun thing? The release of the Nike Air Mag is probably part of a bigger campaign for what is coming on 10-21-2015 http://www.jlaforums.com/viewtopic.php?t=100714389 – especially considering all the other stuff that is going on right now like the Doc Brown Press Conference, etc. Can we say Back To The Future IV anyone? GREAT SCOTT!. Awesome, now all we need is the hoverboard, and we are set. I’m sooooooooooooooooooooooooooooooooooo gonna cop a pair of these joints yo!!! !